Philadelphia, Pennsylvania's Wannamaker Crystal Tea Room of Duncan Hines' day is still around, although it only serves its stupendously elegant meals for the large parties it caters to at that location. It is now known as The Crystal Tea Room. In his guidebook Hines wrote that its "food and service is uniformly excellent in all dining rooms of this famous department store." 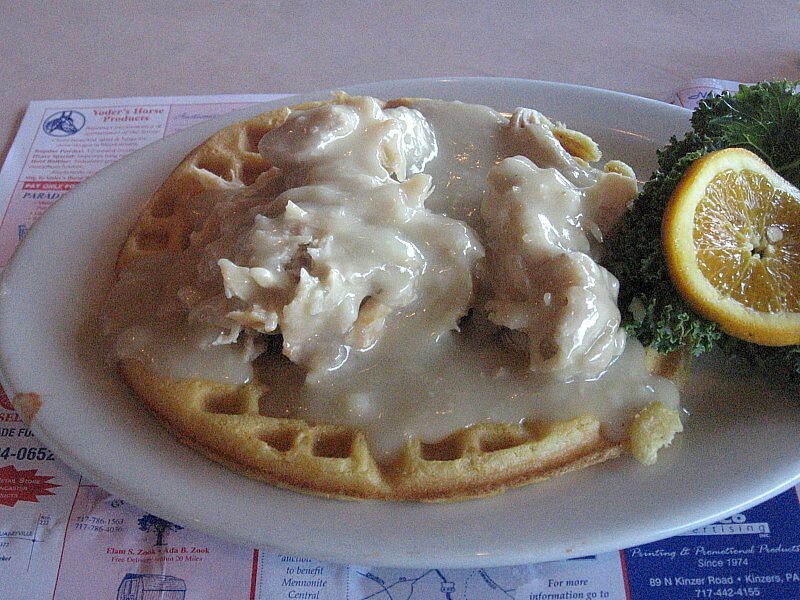 brookquarry is correct.. My first visit to Oregon Dairy was nearly 7.5 years ago and I enjoyed the Penn Dutch chicken and waffles depicted below. On our recent visit to Oregon Dairy near the end of our big trip 2.5 months ago Sandra had the chicken and waffles and I had the chicken corn pie. WJ out of curiosity- how did you like the corn pie? 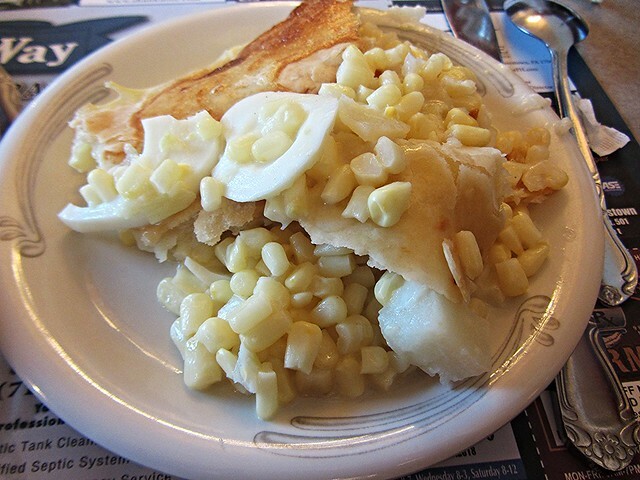 It is a less common Pennsylvania dutch dish- mostly found in NE Lancaster County and Berks County-particularly around Kutztown. He and his wife took us to Durgin Park on a visit some years ago- I enjoyed the cuisine, but I gather that it also relies on tourists for a pretty fair amount of its business. I think that is such a shame that 'heavy' cuisines are dying. While, I am sure, there are a few people who must NEVER EVER eat such foods, moderation is ok for most. Thank heavens for tourists. Local people who only eat out occasionally will not totally blow their diets if they eat a heavy meal once in a while so they needn't fear those restaurants. I know I'm hopelessly old fashioned but there's a lot to be said for meat and potatoes. The Summit Hotel in Uniontown, Pennsylvania is still around. Now known as the Summit Inn, it has been offering weary travelers an elegant place to rest their weary bones for 112 years. Duncan Hines wrote about this hotel in his 1953 guidebook, noting that the "specialties are French onion soup, steaks, chops, fried chicken, sea foods and various desserts." The menu is a little different today (see link). The dining room closes during the winter season. The Washington Crossing Inn in Washington Crossing, Pennsylvania was a Duncan Hines restaurant, and I'm sure he would still recommend it today. In his guidebook he wrote, "the food in this delightful inn is very good, especially the roast duck dinner." Check out the dinner menu. The Duck Confit, described as "slow braise duck leg served over roasted shallots with cinnamon jelly" sounds as if a version of that roast duck dinner might still be around. The "Washington Crossing Garlic Bread" sounds interesting, as do several other dishes. First established in 1880, La Forge Restaurant in Newport, Rhode Island was in Duncan Hines' book of recommended restaurants. Hines didn't have too much to say about it in the 1953 edition: "Enjoys a fine reputation for serving delicious food. French cuisine." That's not necessarily the case today, as a perusal of the restaurant's menu will attest. You don't see Shepherd's Pie on a menu very often. The name of this restaurant was Willcox's. When Duncan Hines ate here in the early 1950s, this landmark Aiken, South Carolina restaurant was nearing the end of its glory days. Presidents and all manner of celebrities had eaten here. However, it closed in 1957. It remained shuttered until April 2002 when it reopened to much fanfare. It is now known as The Willcox (hotel, restaurant, and spa), and it has recaptured its former glory days with much acclaim. It is regularly listed as one of the premiere places to eat in America. When Duncan Hines listed it in the 1952 edition of his guidebook, he said that it was "a comfortable homelike inn where traditional customs will prevail although modernized. Has a quiet restful clublike atmosphere where good food awaits you." It still does. All you have to do is come to Aiken to enjoy some very fine dining. The Poinsett Hotel in Greenville, South Carolina was a Duncan Hines recommended restaurant in his guidebook, "Adventures in Good Eating." It had a long tradition of being one of the best hotels in the state. Duncan Hines said that it was "one of the delightful hotels of the Southeast, located at the foot of the Blue Ridge Mountains." Hines said the specialties were "breast of guinea of Virginia ham under bell, steaks, lobster, fried chicken, Lynnehaven oysters in season, spoonbread," and "real coffee." The Poinsett closed in January 1987 but it reopened in October 2000 as the Westin Poinsett Hotel, and looks splendid. The only spoonbread in its current incarnation is in the name of the hotel's Spoonbread Restaurant. The food is good, but they don't seem to have much in the way of fine dining. The Sylvan Lake Hotel had a Duncan Hines recommended restaurant inside. Duncan Hines didn't have much to say about it. He said that it was a "large, modern, air-conditioned hotel." That's it. I guess he was impressed enough with it for it to be included in his restaurant guide. Here is their dinner menu, serving such things as buffalo stroganoff and an Elk Chop that you won't see on a menu in New England. He wrote of this place: "Small, but neat, attractive setting in canyon surrounded by pines and birch. Specialties: steaks, prime rib, ham, chicken and rainbow trout." Looking over the menu, nothing has changed. Only the ham is missing from the menu of Hines' recommended specialties. Alex Johnson's Hotel was recommended by Duncan Hines. He said that it was an "air-conditioned grill" and had "a dining room" which "is unusually good." The specialties, said Hines, were "steaks and trout, with Elk and Buffalo at times." Today there are three dining options within its doors, one of which is the Skybar. It has a limited menu, but it does seem that regional cuisine reigns, such as the inclusion of buffalo, which is pervasive in most all the menus in this area. Hotel Alex Johnson has an interesting history as well!